Season 6 is coming. 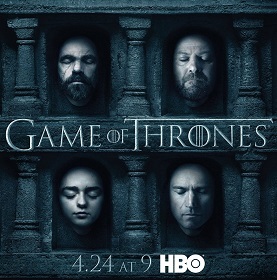 Watch the upcoming Game of Thrones season premiere with HBO’s free weekend preview, April 22-25! Starting Friday, April 22, TDS TV customers will have access to HBO and its vast array of content. The highlight of the three-day preview is the season premieres of Game of Thrones, Silicon Valley and Veep on Sunday night. If you like what you see, add HBO to your TV subscription! Right now, you’ll get HBO and Cinemax for half off when you order. Call 1-855-612-0115 to order now! To determine what channel HBO is on in your area, find your community’s channel lineup here. And for you Game of Thrones fans, stay tuned to this blog … we have more fun stuff coming to get you ready for the Season 6 premiere. COMET TV headed to Minneapolis area!